I have never heard of this type of help with debt service. Is it legitimate? Business Dispute Resolution (including Arbitration, Mediation and Civil Negotiation) is the accepted alternative to protracted legal proceedings. It is the most effective and least expensive means to help with debt. Litigation is expensive, and with overcrowded court dockets, many months or years can be invested before getting to court. That time translates into high attorney fees, court costs, accruing interest on the debt, and long periods of anxiety and stress. Furthermore, once a lawsuit is filed against your business it becomes a matter of public record. This can impact relationships with your vendors, suppliers, bankers and competitors. However, as debt reduction specialists, we have an economical, efficient and confidential solution to reduce your accounts payable, or resolve litigation and judgments, often in a matter of days. My business owes a lot of money. What are my options? Pay in full. Unlikely, considering the financial realities your business may currently face. Hire an attorney. You risk spending much time and money with no guarantee of success. File bankruptcy. Everyone loses. Your business, your employees and their families, and your creditors. Do nothing. Results in negative credit reports, court judgments, increased interest and fees and confiscation of assets. Close your doors and walk away. As in bankruptcy, everyone loses. Have a Certified Debt Management Professional reduce your debts 40% to 80%. A Win/Win outcome for you and your creditors. We can reduce problem payables 40% to 80% or more. And we work on a “no results-no fee” basis. We get you settlements that satisfy you, or there is no fee..
What if I'm short on funds? Not only can we reduce your problem payables by 40% to 80% or more, but we can also arrange extended payment plans that are agreeable to you and your creditors. Can't I settle these debts myself? Yes, but can you get settlements for pennies on the dollar? Our service is based on the assumption that, as a business owner, you have expertise in running your business. Since 1990, our expertise has been negotiating, reducing, and settling business debts. We have settled debts on behalf of hundreds of businesses, often getting settlements of fifteen to twenty-five cents on the dollar. We have a well-documented success rate of over 90% for settling problem and disputed payables. My creditors are very angry with me and I've avoided their calls. Why would they talk to you? As professional debt managers, we are skilled in opening up lines of communication that have been closed. The fact that we are involved demonstrates to your creditor your willingness to come to a resolution. Up to that point the creditor has had grave doubts as to whether their claim would ever be satisfied. Creditors appreciate that a professional third party is involved with the intention of bringing a satisfactory resolution to a long-standing problem. My creditors have turned my debts over to collection agents and attorneys. Can you still help me? Yes. We have over twenty-five years’ experience negotiating with credit managers, collection agents and attorneys in settling and reducing problem and disputed payables. I need to keep certain suppliers. Will they continue to do business with me? We know that business owners sometimes need to keep important suppliers and vendors. We diplomatically negotiate and get your supplier to see the benefits of keeping you as a customer. After a settlement is effected, you may have to pay C.O.D. or prepay for a while until the supplier feels comfortable extending you credit again. There are already judgments and liens against my business. Can you still help me? Yes. We can negotiate and reduce judgments and liens by 40% to 80% or more. Can you name some creditors you have made settlements with? We have had successfully reached settlements with such companies as Verizon, AIG, Time-Warner, FedEx, Motorola, Wells Fargo Equipment Finance, Graybar Electric, Xerox, 3-M Co., RCA/Sony, Ford Motor Credit, W.W. Grainger, Reebok, Hewlett-Packard, Sysco, NEC, Ricoh, Yellow Book, Trane Co., TWA, McGraw-Hill, UPS, Sunoco, Textron, CIT Group, Clear Channel Broadcasting, GMAC, Lucent Technologies, Bulova, Diebold, AT & T, Hallmark, Hitachi, Sanyo, Infinity Broadcasting, GE Capital, Toyota Motor Credit, Leggett & Platt, Babcock & Wilcox, Thomas Publishing, CitiCapital, Kimberley Clark, Gitano, CIBA-Corning, Yellow Freight, Seiko, The New York Times Co., HIP, insurance companies, leasing companies, bonding companies, receivable financing companies, suppliers, distributors, manufacturers and hundreds of other local and international companies. What kind of business debt can you negotiate? We negotiate and settle past-due and disputed payables, judgments and liens owed to vendors, suppliers and creditors. These debts can be secured or non-secured. Even if you have personally guaranteed a debt we can still negotiate a settlement for you..
How long does it take to settle a debt? In most cases we can settle your problem debt or disputed payables in a matter of days. Occasionally, it can take a little longer. We have settled debts for a wide variety of manufacturers, construction companies, wholesalers, distributors, retailers, service-oriented companies and many others. We can help you no matter what size your business is or where in the world your company is located. Shouldn't I hire an attorney for this? Lawyers are good when you have legal problems, not financial problems. When you have a financial problem, hire a financial specialist, such as a Certified Debt Management Professional. When you hire an attorney, there is no guarantee of how long it will take, or what the final outcome will be. Once a debt moves into the legal system, more time and money is wasted responding to summonses, and appearing for depositions, hearings or trials. All the while, your debt keeps growing (interest, court costs, attorney fees). Wouldn’t you rather use your money to pay your creditors instead of paying legal fees? Since 1990 we have been assisting businesses in restructuring and settling open or disputed invoices, delinquent accounts payable, pending lawsuits, judgments and liens. Wininger, Douglas & Green is comprised of business arbitration specialists who understand the time and expense associated with traditional defenses, as well as the public embarrassment should a company’s position become known to their vendors, suppliers, creditors, bankers and competitors. Because of this understanding, our negotiations are conducted in strict confidence. Wininger, Douglas & Green represents debtor businesses exclusively. We do not represent creditors. Our extensive experience in professionally negotiating, reducing and settling business debt allows us to intercede on behalf of the client who is experiencing financial disputes or challenges arising out of routine business transactions. On behalf of hundreds of our clients, we have successfully negotiated payables in collection, lawsuits, judgments and liens, in order to obtain the maximum reduction of debt owed. Richard Wininger, CDMP, owner and Principal Negotiator of Wininger, Douglas & Green, has been practicing Business Debt Negotiation since 1990. He is a Certified Debt Management Professional and a founder of the Association of Debt Management Consultants, and conforms to its strict Code of Conduct & Ethics. 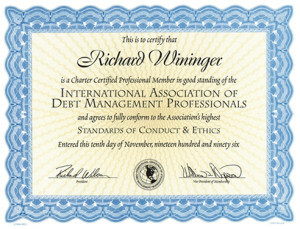 Mr. Wininger is internationally known as a speaker, consultant and teacher in the areas of business debt management and business dispute resolution. How would settling debts affect my credit rating? Often our clients come to us after creditors have already made derogatory reports to credit agencies. Settling problem or disputed debts allows these reports to be updated to reflect that settlements have been made and the creditors’ claims have been satisfied. In this way we help your business re-establish a positive credit rating. Can you help collect our receivables? Yes, but not by traditional collection methods. With our Pre-Arranged Settlement Program, we can resolve your problem accounts receivable at no cost to you whatsoever. When we contact your customer we do so with tact and discretion. The result? You receive cash immediately and retain your customer. Call us for more details. Our negotiations are conducted in strict confidence, so you maintain the integrity and creditworthiness of your business, without further public exposure to suppliers, bankers and competitors. Our fees are success-based. If we can’t get you a settlement that is to your satisfaction, there is no fee. So, the only real risk to you is in not taking action.